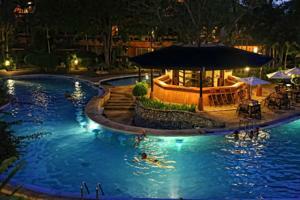 Loma Resort & Spa reflects the tranquility of its surroundings that North Pattaya is known for. With its garden-like settings, swimming pool and warm hospitality, it creates a calming atmosphere. At the Loma spa, you will be able to indulge in their wide array of treatments that range from body scrubs to facial, foot and body massage. Dine at their restaurant, which serves both international and local cuisine. 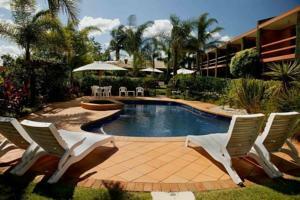 Loma Resort & Spa also has banquet and meeting facilities that are well equipped. While providing guests, a quiet and relaxing stay, Loma Resort & Spas location is only minutes away from the city and its nightlife venues. Rooms: Hotel Rooms: 124, Hotel Chain: Sunshine Hotels & Resorts. Wi-Fi is available in all areas and costs THB 100 per hour. Free! All children under 2 years stay free of charge when using existing beds. Free! All children under 2 years stay free of charge for baby beds. All older children or adults are charged THB 825 per person per night for extra beds. The maximum number of extra beds/baby beds in a room is 1. Any type of extra bed or crib is upon request and needs to be confirmed by management. Additional fees are not calculated automatically in the total cost and will have to be paid for separately during your stay.